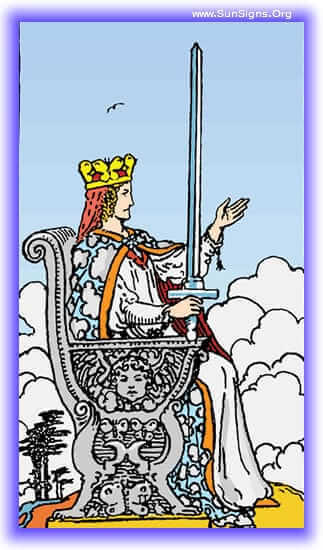 In the Queen of Swords tarot card, she sits upon her throne, her vision clear, utterly discerning. She is fooled by no one, and her countenance is stern. Her eyes hold the glimmer of the quick-thinking, cataloging and organizing everything she surveys into neat little categories. She seems to see right through you, picking out what you wish to hide. She is utterly confident, completely independent. t also a weakness in that she sometimes lack compassion. The past events have required you to be strong and impartial, and while it has sometimes been difficult to keep your vision clear, you have thus far been successful. It has resulted in your guidance being fair, though there may have been some bruised feelings along the way. Your current situation calls for you to make judgments free from sentimentality. Letting your emotions get in the way of your decisions will only lead to them being more difficult than necessary. Perhaps this may not be the best choice you could have come to. Those who may be hurt along the way will recover, and thank you for it in the future. There is a time coming your way when your normally empathic ways will have to be dampened by the impartial view of the passionless Queen. It will be difficult, but it will not be tough to discern when it comes to pass. Be ready, be stern, and all will go as you need it to. 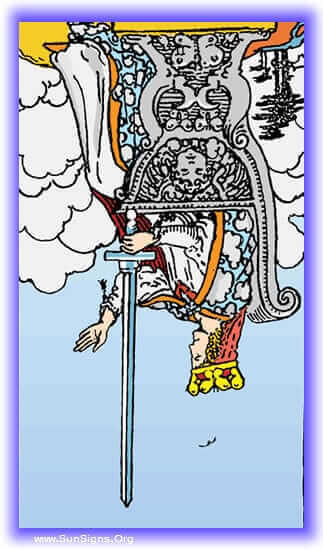 The Queen of Swords inverted has forgotten her greatest strength, and is being ruled by her heart. Her decisions are set in the hopes that she will not bring harm to those about her, but such sentimentalities are going to ultimately harm more than they preserve. Her relationships are causing her vision to be impaired, trying to remain the balance rather than allowing for the necessary upset. This can also indicate that she is ruled by her emotions, allowing bitterness and anger to show its face in her decisions, making decisions out of spite rather than logic. You’ve been struggling to keep your vision clear, being ridden by your emotions when what you need is a clear mind. This may be a sign that you’ve been manipulated by those closest to you, interfering with your decisions. Do not allow your bitterness to stand in the way, you know you are being backed into a corner, and it will require decisive passionless action to clear the path. Keep your emotions in check your highness. The anger you carry is clouding your judgment, and interfering with your ability to do what is best. Instead you are doing what feels best, and sometimes it is that decision which makes others suffers. It’s time to take a step back and think things through from a calmer space. The Queen is coming, and she is in a fury. The situation you find yourself in is about to come under the hand of a tyrant Queen. She will take her wrath out on those involved, making decisions that drive the course out of the straight and narrow, and into that which suits her best. There may be a way to divert her back to a better course with reason, or you may just need to get out of the way.